In my first commission I was asked to submit a proposal for an enclosed garden which had not yet been made. In the process of studying the space, I decided to make a work of art which would surround you. I was very excited by the idea that this could be much more than a sculpture around which one can walk. Regarding an environment as a specific area, I decided to give a name to art which was the environment itself - 'environmental sculpture'. The term 'environmental' was more or less a reaction to the limited possibilities of sculptors to only make a sculpture as an object, however large or consisting of parts, and install it, or them. At the most it used to be possible to adjust or alter the area or space in which the sculpture was placed. In the late sixties of last century there was little concern for the environment in terms of wasting natural resources and irreparably altering our environment (I use the term here, because we now understand how its meaning has shifted from only describing our surroundings towards encompassing the understanding of our responsibility to respect and preserve our natural habitat. In Joop Beljon's book, Bouwmeesters van morgen I saw André Bloc's sculpture, habitable (inhabitable sculpture). Though both sculptures belonged to a style of working which were far from my aspirations, I grasped the idea of sculpture which one could occupy. I had met Joop Beljon during my studies at California State University at Long Beach, California. Long Beach symposium was the first event of its kind held in the United States. More importantly, it was a significant experiment in the formal collaboration of art and technology. Each of the invited artists (selected from a worldwide list of distinguished sculptors) was paired with an industrial sponsor who provided technological assistance in the form of expertise, assess to facilities, equipment, and materials. The on-campus site also provided students with the opportunity to observe and assist established artists in an environment that was very different from the usual classroom activities. André Bloc was one of the other sculptors who participated in the Long Beach symposium. Habitacle (cubicle) no.1 (1962), Meudon, France 1964). But the sculpture which struck me most was Joop Beljon's Homage to Sam Rodia. 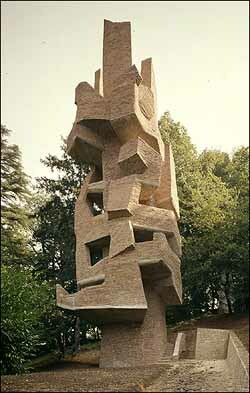 It is a sculpture consisting of different elements with a space between them. In that way you could enter the sculpture and be between its parts. This, was something new in art. Somehow the sculpture enclosed its own environment. I wanted to pursue this way of working, but then with a total environment in my sculpture, and decided to call this new development in my work 'environmental sculpture'. In that time it was as if a new world had opened itself to me.